Our Orange Dragin Group customer was preparing for their large annual employee meeting. 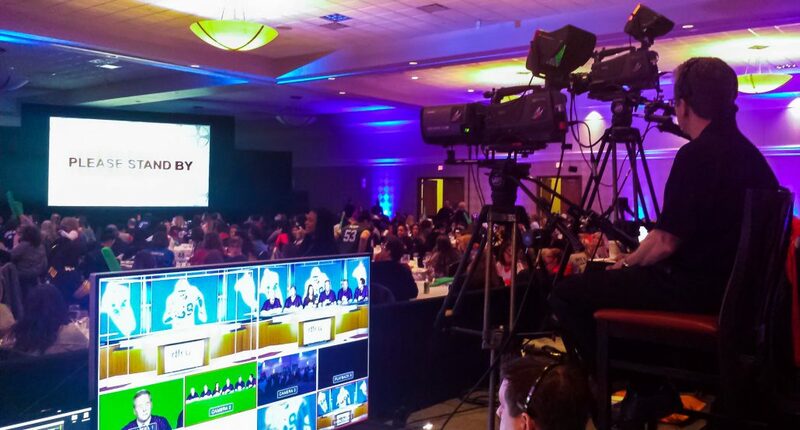 Orange Dragin provides the audio / video / lighting and staging support for this event. The client usually prepares the creative for this meeting. The morning is usually reserved for a keynote speaker and some team building exercises. The afternoon is set for financial information and awards. They select a yearly theme for the executive staff to utilize to present the company information to the employees. It is always a fun way to deliver this sometimes, dry information. This year, the client chose a “sports show” theme. Where the executives will be sports reporters on a panel talk show. Employees were encouraged to wear jersey’s of their favorite sports teams. And table decorations supported the theme. 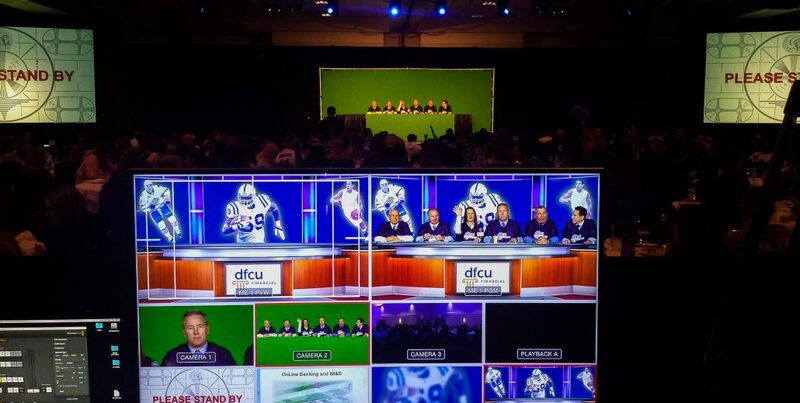 In our preproduction meeting for this live event, they wanted us to build a cool looking sports desk, and during lunch, we would bring this set onto the stage for their afternoon presentation. But we had another idea to present to our client. Instead of the cost of building a cool looking sports talk show desk, why not just incorporate an on stage green screen and “key in” a cool looking virtual reality sports desk. We already have two cameras on the job recording the event and providing Imag to the screens, so everything was already in place. This was well received as a great concept. So at lunch, instead of moving furniture, Orange Dragin dropped a 10 x 24 green cloth over the back drape behind stage and covered the table on stage with a 10 x 10 green screen cloth. The live audience would see the CEO & executives on stage with a huge green screen cloth behind them,but after running the camera through our switcher, and adding the virtual set animation, we bought for less than $100, the employees could watch the “sports talk show” on the two flanking side projected screens, as a live tv show, and see the magic of green screen technology before their eyes. We even had two angles selected on the virtual set. One for a wide shot and one for a tight shot on whoever was talking. This is just an example how Orange Dragin can work with you on your live event and offer some creative ideas to make it, a little more special.